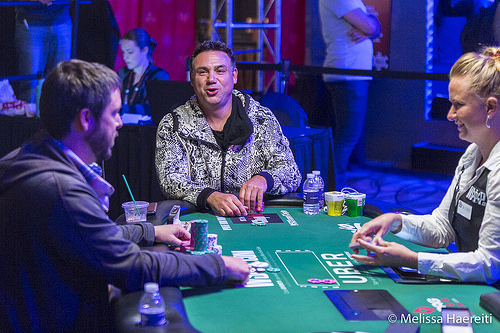 Dmitry Savelyev limps on the button and Loren Klein checks his option. The flop is . Klein bets 75,000 and Savelyev calls. The turn is the . Klein bets 150,000, and Savelyev pots to 720,000. Klein looks him over and raises. Savelyev calls for the rest of his chips and they table their cards. Savelyev has the nut straight with the nut flush redraw. The river changes nothing and Savelyev gets a big double up.